About a year ago, I posted an entry about a green apple chicken salad. I am partial to chicken salad, and even more partial to apples in a chicken salad. With a bit of tart and a bite of sweet, a crunchy apple offers just the right complement to the celery and cranberries which accompany it. 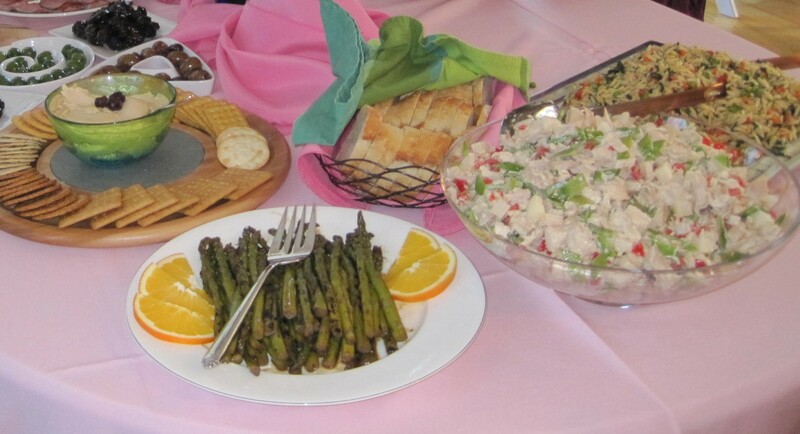 Chicken salad was on my menu for an afternoon baby shower last December, but the green apple version had already made repeat appearances for the women invited. I was searching for something a little different. A cookbook provided the germ of an idea – sesame oil and red bell peppers — and California did the rest. Apples were no longer in season, but piled high at the outdoor produce markets was the Asian apple-pear or Asian pear, also called nashpati in Bengali (নাশপাতি). 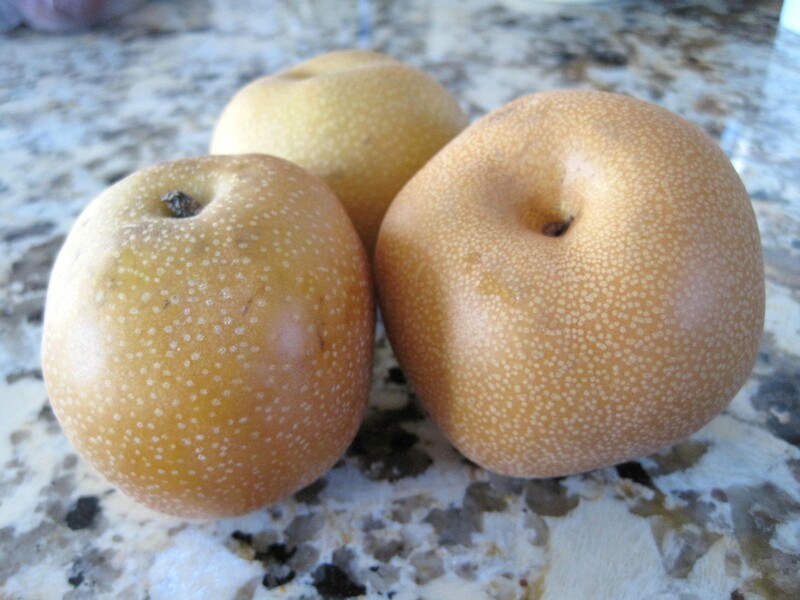 It hides underneath a modest ochre skin, but the Asian pear is part of the sisterhood of personality. It lacks no shortage of charisma or scrumptiousness. And it has long been a favorite of my mom’s, who introduced it to us when we were children, and to this day, she delights in the discovery of a perfectly crisp, perfectly juicy nashpati. Now I must revise a bit. I am still partial to apples in my chicken salad. But perhaps I am just a teensy weensy bit more partial to the singular pear, quietly camouflaged as an apple. This variation of chicken salad is less sweet and more savory than its green apple cousin, although the Asian pears I bought in California were intensely sweet. The crunch (and color) mimicked water chestnuts, but the flavor surprised people, which was a nice touch. For a sweeter chicken salad, omit the red bell pepper and substitute dried apricots cut into a small dice. Add a little honey to taste. For everyone who has asked, I am very belatedly posting the recipe for the chicken salad I made at R’s baby shower. Sauté pea pods briefly, about 2 minutes, to remove any raw, grassy taste. Set aside and cool. In a large bowl, combine sesame oil, olive oil, vinegar, soy sauce, sugar, yogurt, sour cream, salt and pepper. Mix thoroughly to combine. Add chicken, Asian pear, bell pepper and pea pods to the dressing. Stir convincingly until everything is coated with everything else. Put into fridge and chill for at least an hour. Serve to guests with fruit and bread, or, sit in front of the television with a fork and a glass of white wine and do not share with anyone. This entry was posted in Asian Pear, Bell Peppers, Chicken, Poultry, Salads and tagged Asian Pear, Chicken Salad, Fruit, Nashpati, red bell peppers. Bookmark the permalink. The chicken salad was delicious!! It was nice to have a different set of flavors compared to the standard green apple chicken salad. I can’t wait to try the recipe & have it again. first time in ur space n i loved it !! !I loved the flavors in the salad !! !different from the usual…looks delicious too!! !following ur space…do check out mine in ur free time !!! first time in your space n i loved it!! !I loved the flavors going in this salad…different from the usual one…looks delicious too!! !following ur space….do check out my space in ur free time !!! Hi Sonali — Thank you for visiting and for the compliment! I really like onlyfishrecipes.com — great idea.